Merry Christmas 2014! And you know what that means – Penguin DT bag of Christmas goodies! This Christmas Eve we're introducing you to one of the key characters of TAGAP 3, Paola the Funky Companion! Here she is, with a full character wallpaper! For the full details on who Paola is, check out the brand new Making of TAGAP 3 blog post. There's plenty of new information in the post, explaining the society of Pluto and what Paola's place in it is. And this wouldn't be a holiday special without actual in-game media, so here's a new screenshot from TAGAP 3, featuring the very first boss fight... with a character that will be introduced proper later in 2015! Oh my, it's Holiday Season 2014 already? 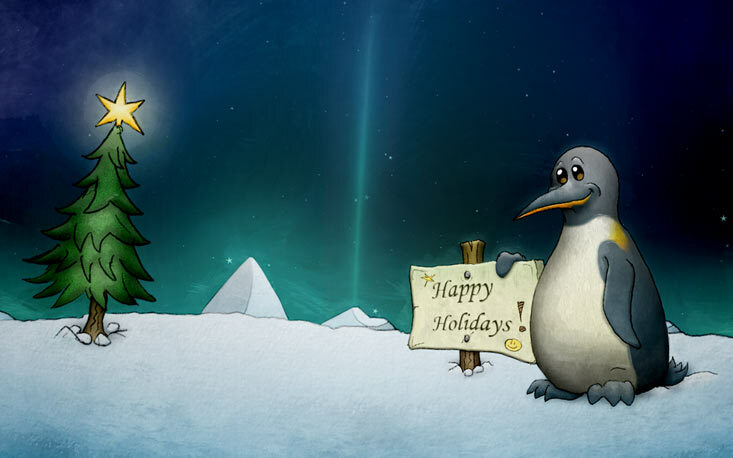 Well, that means it's the time for the 7th annual Weekly Penguin Season Greetings eCard! As always, If you haven't sent your eCards yet, feel free to use this one. Surprise! The original TAGAP returns with a brand spanking new v2.0 update! The new version brings forth loads of improvements, most importantly the anti-whitebox fixes seen earlier in TAGAP 2, as well as improved multithreading model that fixes compatibility issues with 64 bit systems. In other words, if you ever had a technical issue preventing you from enjoying the original TAGAP, now it's time to update and see what the 2007 cult-hit was about! As usual, the update is available both as a full installer and as an update. Head to TAGAP downloads section to get yours. The mirror lists will be updated when new ones come available. I know this update has been a long time coming and the delays are all my fault; I've been so into TAGAP 3 development I honestly forgot I still hadn't finished this patch! Extra special thanks to all the fans who prodded me awake on the matter. We have again something special to accompany this week's Weekly Penguin; TAGAP 3 wallpaper from the webcomic artist Philip Pan! 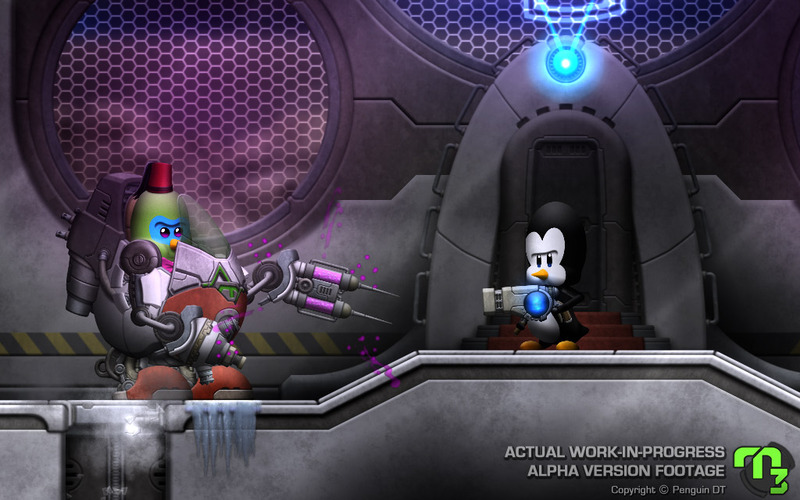 The wallpaper presents a crossover between TAGAP 3 and Pan's Waddle Pond, featuring Walter and Cat from the comic, as well as TAGAP 3's penguin prisoner from Pluto. For more information on both Waddle Pond and how this wallpaper came about, check out the Weekly Penguin feature. Thank you too, Philip Pan! We love this one! Non-TAGAP penguin news time! You know, there's a sort of an in-joke here among Penguin DT folks about these beautiful Antarctic shots of penguin colonies with hundreds of birds; "if you get bored, try counting these". Well, that is no longer a joke, but an actual thing you can do... for science! Zooniverse's Penguin Watch is basically a crowdsourced Antarctic wildlife photography annotation project. All you need to do is to spot all the penguins and their eggs in the photographs and place a tag on them within the image. By doing this you're not only helping in cataloguing the photos, but you are also helping the scientists in data gathering. So, next time when you start getting bored at your office, school or where-ever, just load up www.penguinwatch.org; You get to pass time watching adorable penguins, all the while helping scientists in understanding Antarctic wildlife. If that isn't a win-win scenario, I don't know what is. The very first Behind the Scenes video for TAGAP 3! For more information on the video, check out the new blog update. You may have noticed that we're one day early with our celebrations. Well, Finland being plagued with heat waves and thunder storms right now, we decided to play things safe and get this out while our connection is solid. But I'm sure none of you TAGAP followers will complain about getting TAGAP 3 goodies a day early! 100 Twitter followers means there's a thank-you screenshot! We've reached 100 Twitter followers – and as a thank you to everyone, here's a new TAGAP 3 screenshot! 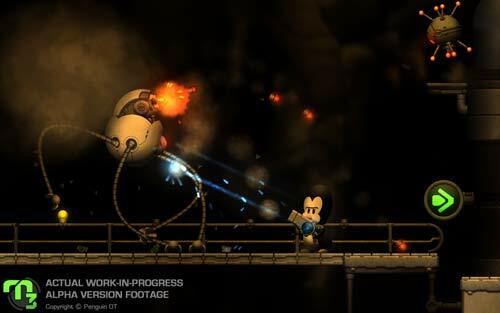 This one was captured from the most recently finished level and features Pablo dodging the grenade barrage from the Longlegs robot. Also approaching from the right; Space penguin take on the floating mines. Again, thank you for bearing with our 140-letter ramblings so far! Yes, it's the second of the two annual penguin days, The World Penguin Day! Just in time for the occasion, The PEW Charitable trust has launched a global penguin conservation project, which aims to stop the decline in penguin species through the first worldwide effort to address threats to their populations. The goals of the project are to establish large marine reserves in Antarctic waters and to protect and maintain breeding and feeding grounds throughout the Southern Hemisphere. For more information on the project, please head to PEW trusts' penguin project site – and remember to fill out their petition, too! Let everyone deciding on these matters know how much you love these flightless, monochromatic wonders! And like the Penguin Awareness Day earlier this year, today, too, has a Doctor Who connection. You see, the last of the 50th anniversary celebratory goodies announced last November finally became available for purchase; Silva Screen Records' Doctor Who: The TARDIS Edition. Since this epicness marks the end of the anniversary holabaloo, I thought this, combined with the World Penguin Day, would be a perfect opportunity to roll out the rest of The Eleven Penguin Doctors solo wallpapers! They are available – together with much more penguin goodness – in our penguin downloads section. It's Valentine's Day – for us Finns that's a day of friendship, while the rest of the world views it as a day of love – and one particular love story has taken over the Internet like a storm. It's the story of a ten year old female penguin Sakura who apparently has fallen for her caretaker, Tsuyoshi Notsu. After Sakura's partner Musashi passed away, Sakura's affections turned towards Notsu – and now Sakura follows him everywhere striking courting poses. Sakura and Notsu can be spotted at Matsue Vogel Park, an aviary park in Shimane Prefecture of Japan. You know, stalking and relentless courting is disturbing, but if the stalker was someone as awesome as Sakura, I wouldn't mind one bit! Do you feel depressed about the weather? Well, you are not alone; Penguins of Scarborough's Sea Life Centre are depressed, too. While Humboldt penguins live in pretty extreme conditions, the endless downpour and winds have made the ones living in the UK Sea Life so miserable that they've actually been described happy pills. And those thinking this is just captive birds treated badly getting bored out of their minds, it is not. In fact, in the nature penguins are known to succumb to even suicide. For example on Antarctica, sometimes a penguin just gets up and start to waddle to the centre of the continent, a place where pretty much nothing can survive. No-one really knows why this is, but one of the more popular theories points to the climate change. In this light I'm glad to see the little fellas of Scarborough are being looked after. I can personally attest to the positive impact of antidepressants and if the penguins find them helpful, too, then all the better! To read more about the case, check out posts on The Guardian and/or MSN. Penguins popping pills in real life, who knew? Just don't give them Uzis. Penguin and Tom Baker Awareness Day! You know what day it is today? It's something beyond awesome – it's Penguin Awereness Day! Not to be confused with World Penguin Day (April 25th), the name of the day says it all; Find out more about penguins and remember to tell everyone you meet how much you love those monochromatic waddlers! But wait; This isn't just another yearly awareness day. This also happens to be the 80th birthday of the one and only Tom Baker! So, let's combine the two great things into one by giving The Penguin Tom Baker (from our Anniversary artwork) his own wallpaper! Happy Birthday, Mr. Baker – thank you for all the great times, and may there be many more ahead! So, it's 2014 now; The Year of The Doctor is behind us and were in the Year of Godzilla. And of course, TAGAP 3 progress keeps happening at a steady pace. While the game won't be out this year either, we do have new media reveals planned for easing the wait. So keep checking back! Also, the weekly appearances of our Weekly Penguin feature continue as usual. Last week may have ended the year with a bang, but this year starts with something special, too; Poketti penguin Sydney. Finally, we're updating our SoundCloud again this week with more stuff from TAGAP soundtracks past, starting with Pablo, Pedro & Pingu 2011, the ending song from TAGAP 2 most recently heard in the Jack and Ricky video of the New Year.